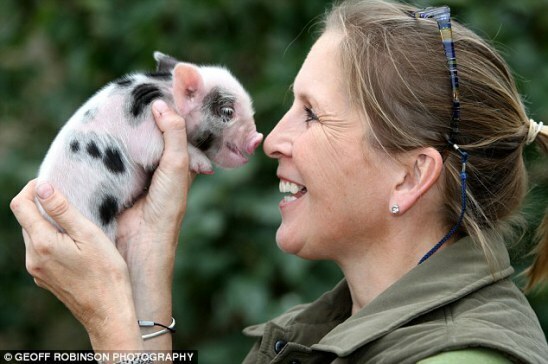 Jane Croft is one British tea cup pig breeder who recently gave up her job to breed the little ones full time. Her website gets about 4,000 hits a week and she receives dozens of emails and calls every day from people all over the world interested in buying her pigs. Pigs are more intelligent than dogs or cats, considered to be the fourth most intelligent species behind humans, monkeys, and dolphins. They are also extremely companionable and like to watch TV... and they reportedly "talk." It is recommended that you purchase a pair of tea cup pigs so that they don't get lonely when you are gone. Miniature pigs love to learn tricks and do so easily, but they are prone to laziness as they get older, so you have to give them daily exercise, even going for a long walk daily, to keep their weight down. Additionally, you can't be lax on the firm but gentle discipline, as they become spoiled easily and attempt to dominate their owners when it comes to getting their own ways. Speaking of weight and size in general, the tea cup pig is only tea cup size when the pig is born, so "tea cup" is really a misnomer. Though a tea cup grows to only one-tenth the size of a full commercial farm pig, it's full height is about knee-high and it weighs about 55-60 pounds so you can forget about carrying the cutie around in your purse or backpack. Junes, and Glouster Old Spots to create her tiny spotted micro pigs. 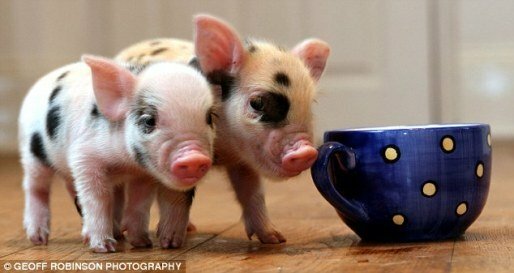 But the push is for breeders to make the tea cups smaller and smaller, a very controversial issue for pig advocates. 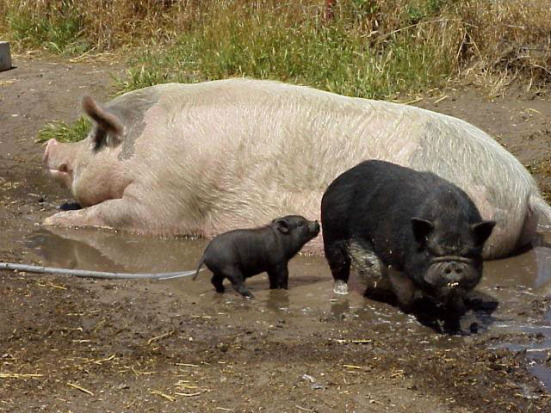 A writer for the Southern California Association of Miniature Potbellied Pigs (SCAMPP), says the trend for smaller and smaller pigs amounts to animal cruelty, as the pigs are starved, or overbred, in order to be small enough to breed. Further, SCAMPP claims, breeders will say anything to insure that the tea cup pigs will remain small, but when they don't, hundreds of the pigs end up in shelters or foster homes because they grow larger than what was promised - possibly up to 90 - 150 pounds, the normal size of a potbellied pig. "They have been known to tell people that their pigs are "micro-minis" or "teacup pigs" and that their pigs will get no more than 30 pounds," the SCAMPP member writes of breeders. "They will show you the cutest teeniest tiniest newborn piglets, fewer than 10 pounds or so, then show you the parents of the piglets. Keep in mind that pigs can breed when they are only 3-4 months of age. Therefore, naturally if they have bred the pigs at 3-4 months of age, the parents will obviously still be fairly small, yet the breeder will tell you this is the “full-grown size” of those cutest teeniest tiniest piglet’s parents, without telling you the age of the parents nor mentioning the fact these pigs continue grow until 3-4 years of age." SCAMPP is recommending that here in the U.S., pet pigs be adopted from shelters rather than purchasing them from breeders. Tea cup pigs may be a hot trend but they are a very new trend that may produce as many pig shelters as dalmatian-shelters after 101 Dalmatians. I would not latch on to this trend until proper tea cup breeding standards have been established; the last thing we need are more homeless pets.